Owning the adventure and enjoying every challenge requires confidence and the right equipment. When it comes to protecting your truck -- and adding a flash of style -- nothing is better suited for the job than LUVERNE Textured Rubber Mud Guards. These heavy-duty mud flaps are made with a vehicle-specific design and a unique combination of tough rubber and bright stainless steel. 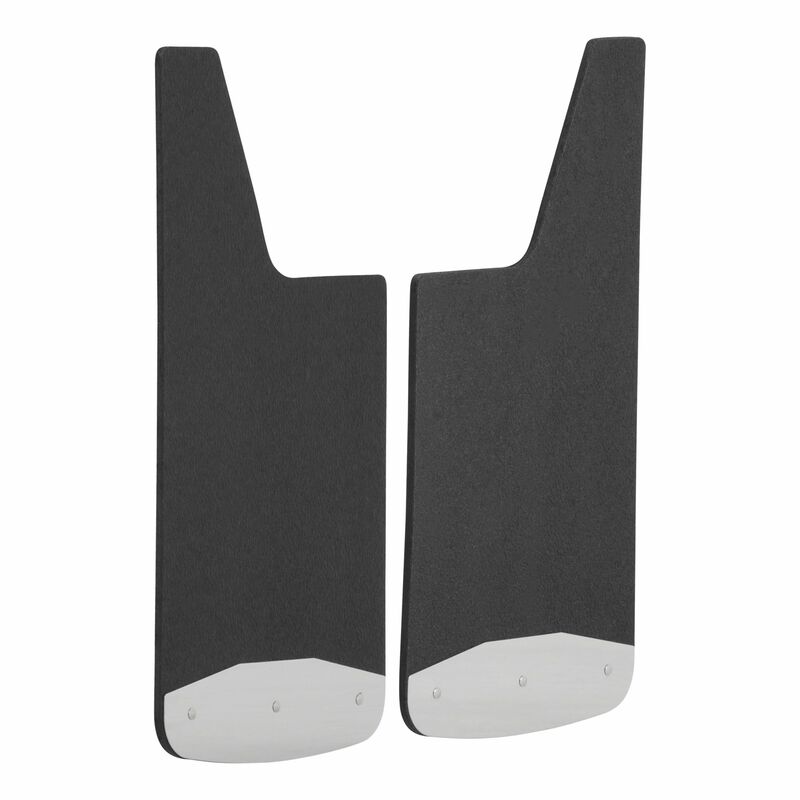 Textured Rubber Mud Guards are the ideal accessory to outfit your pickup truck for the long haul. Their heavy-duty construction allows them to withstand gravel spray and other debris, keeping it from scratching and scuffing up the sides of your vehicle. Whether you're headed offroad or you're equipping your truck for commercial jobs, these truck mud flaps add professional-grade protection and functionality. 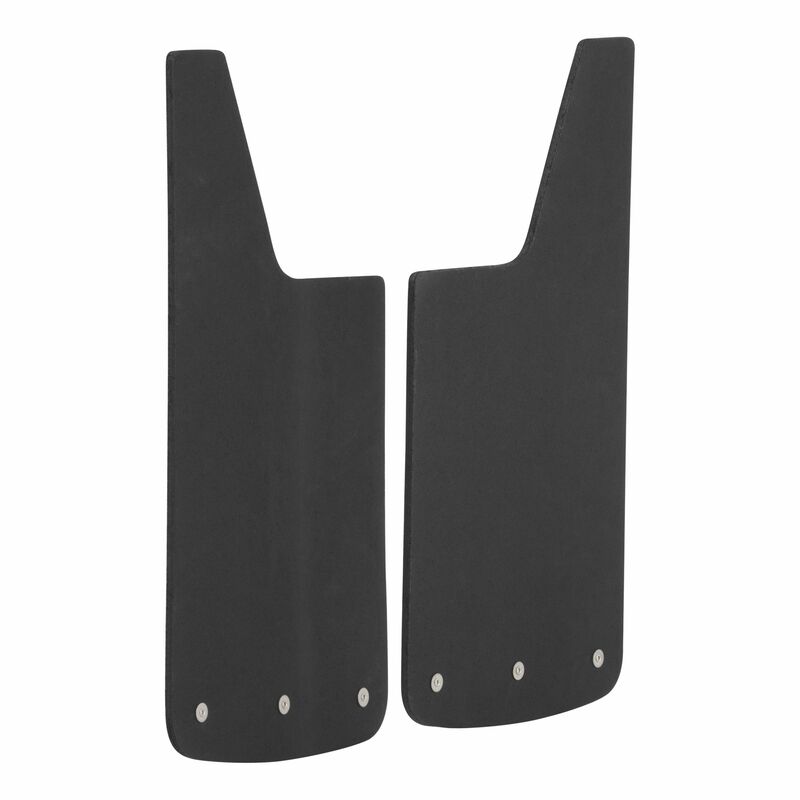 Each truck mud flap is constructed from 3/8" thick recycled black rubber, allowing it to stand up to heavy abrasions. All are made right here in the USA for uncompromising quality. The surface of the mud flaps is also highly textured, helping to hide minor scuffs, scratches and grime. 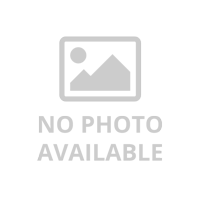 This enables them to maintain a cleaner, more professional look in spite of hard work. For added style, Textured Rubber Mud Guards feature stainless steel plates along the bottom edge. These plates give your vehicle a professional finishing touch while easily outlasting the elements. The 18-gauge stainless steel is highly resistant to corrosion and has a bright polished finish for a sleek shine. LUVERNE Textured Rubber Mud Guards are engineered for vehicle-specific application. This means that each set is custom-fitted for a unique truck, offering a superior, integrated look with an easy-as-possible installation. 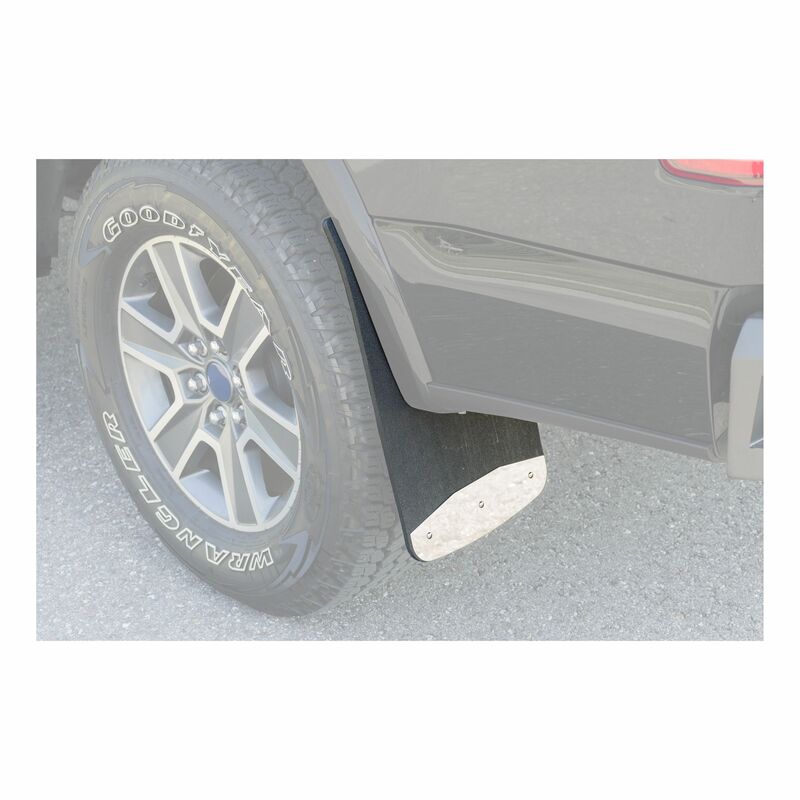 This set of custom mud flaps is designed to fit specific years of the Ford F250 Super Duty, F350 Super Duty, F450 Super Duty and F550 Super Duty (check the application information to ensure compatibility with your truck's year, make, model and style). We also offer a number of universal mud flaps if a custom application is not available for your truck. 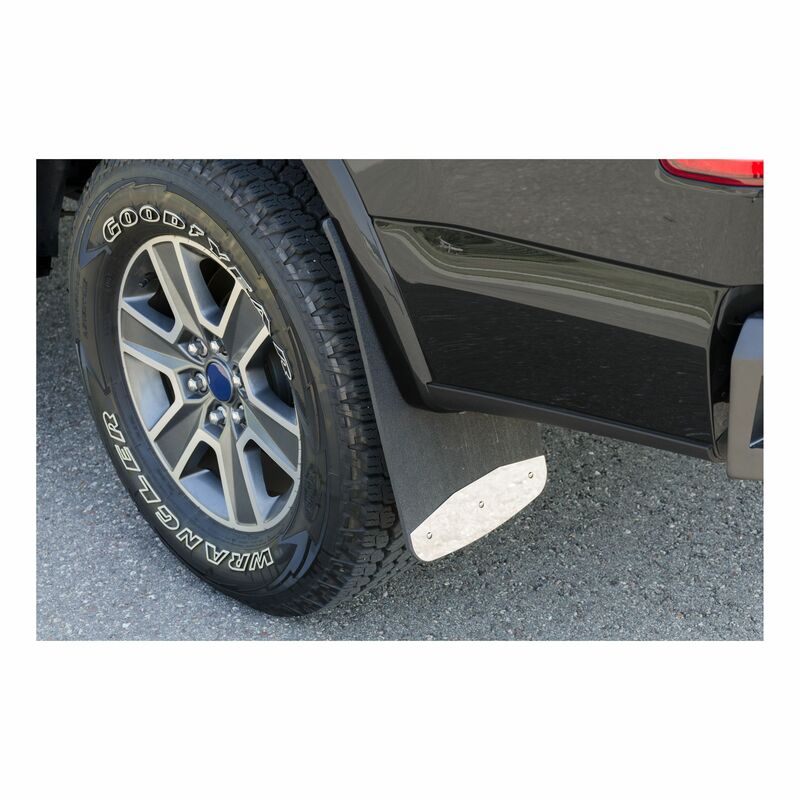 For a complete installation, these Ford mud flaps come with all necessary mounting hardware. The hardware is protected with a corrosion-resistant finish for long-lasting dependability, and the included brackets are also shielded with a durable powder coat finish.